The age-old finger-wagging dictation to “Eat your vegetables” may have haunted you as a kid, but as a caregiver, you may now be having to beg the same thing of your own parents. Nutrition plays such a critical role in the health and wellbeing of the human body, especially in older adults with chronic conditions. The truth is, however, doctors don’t often weave nutrition components into their treatments for patients. I remember that Mom’s original neurologist never even asked us about what Mom ate or how we were managing her unexplained weight loss or anything. It was only when she went into the hospital and Medicare required a nutritionist to visit that we actually spoke with someone concerned about her diet. And even then, they seem to think that Mom’s dysphagia resigned her to meals composed of Ensure, applesauce, and pudding. I am here to tell you that no matter what state your loved one is in, there are TONS of ways to ramp up the nutrient value of their meals by incorporating more plant-based foods. Science strongly supports plant-based eating, especially when it comes to replacing red meat with plant-based proteins. Even replacing as little as 3% of your total calories with plant-based proteins could reduce your risk of dying from cardiovascular disease by 12%! Plants are also full of health-boosting antioxidants, vitamins, minerals, and fiber that help to support a healthy weight, combat cell damage caused by free radicals, keep your loved one regular, and protect their immune system against infection. The wide variety of plant-based foods also gives you the ability to try new meals and combinations that might tempt even the most persnickety parent who rarely seems to have an appetite. Grate veggies like carrots, parsnips, zucchini, and squash into everything from pasta sauces to curries, stews, etc. It’s easy to think that eating more fruits, vegetables, legumes, nuts, seeds, and whole grains is going to break the bank. While healthier foods do seem the priciest in the store, one study actually found that eating healthy saves you money in the long run when compared to eating the cheapest diet recommended by the USDA. Buy canned or frozen organic fruits and vegetables. There is a growing body of evidence that shows canned and frozen varieties are just as nutritious as fresh, often because their nutritional content is maintained when they are flash frozen or canned right after being picked (as opposed to fresh vegetables that may travel over several days to reach your store). Just remember to buy fruit that is canned in its own juices without added sugar and vegetables that are canned in water without added salt. Buy in bulk. You can save several dollars per pound when you buy beans, nuts, grains, seeds, and dried fruit in bulk. Most whole food stores offer this option and even provide bags for you to take your bulk items home in. Go to the farmer’s market. Look online to see if there is a local farmer’s market or tailgate market you can shop at. The foods at these venues are often very-well priced compared to expensive grocery stores and the produce is super fresh having just come from a farm a few miles away. Enhance pre-made meals. If you don’t have the time or money to put together your own gourmet butternut squash soup for your loved one, buy an organic pre-made boxed or canned version and then just bulk it up with some inexpensive legumes, lentils, or canned veggies. Don’t forget the cheap (yet healthy ingredients). Brown rice, potatoes, bananas . . . these plant-based foods are chockfull of healthy ingredients and are typically some of the cheapest items in the grocery store. Shop at a warehouse store. If your Costco or Sam’s Club membership has largely just supplied adult diapers, Ensure, and other helpful caregiving supplies, it might be time to check out their produce, frozen, and canned food store sections too. They often offer great deals on bulk sets of organic canned beans, large containers of organic berries, and more. 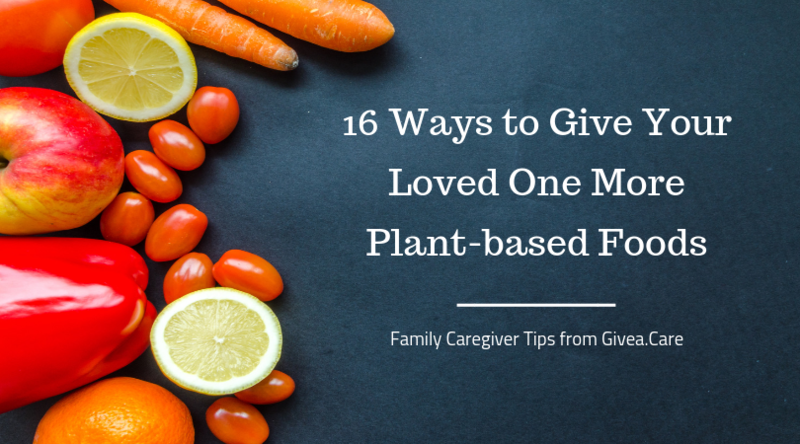 How do you get your loved one to eat more plant-based foods? Do you have extra tips on how to save money on healthy, organic foods?